Established in June 2010, the Australian Urban Research Infrastructure Network (AURIN) is an initiative of the Australian Government under the National Collaborative Research Infrastructure Strategy (NCRIS) and associated programmes. a one-stop online Workbench with access to thousands of multi-disciplinary datasets, from hundreds of data sources and analytical tools covering spatial and statistical modelling, planning and visualisation. AURIN aims to provide researchers with access to diverse sources of data, the ability to integrate data across disciplines and interrogate that data to answer their research questions. Inform evidence-based research, policy and decision making. Improve Australia’s ability to undertake collaborative research domestically and internationally. AURIN enables Australian planners and researchers to make informed decisions about future infrastructure and urban environments based on realistic scenarios and evidence-based analysis. AURIN has an unequalled, and globally unique ability, to source and integrate a myriad of clean data sets that can provide the ‘right answer’ to urban planning problems, at all scales of development. In using AURIN, Australian city planners can join landmark ‘smart cities’ like Singapore, Chicago and Amsterdam as leaders in planning and sustainability. Demonstrating the availability and appropriate application of open source and creative commons initiatives in government decision-making. creating more viable and sustainable cities and regions in which to provide services and infrastructure. Improved wellbeing, health, quality of life and productivity of Australia’s urban communities. AURIN works with more than 100 institutions including: Australia’s leading universities, researchers, data custodians and government agencies. 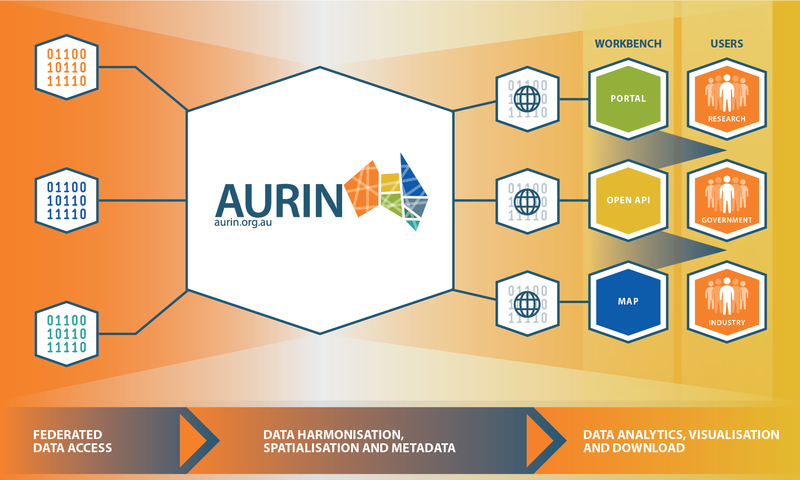 More than 500 people from the research, policy and practice communities are engaged in the AURIN project and more than 100 people are involved in AURIN committees and expert groups. The AURIN collaborative network simplifies interactions between researchers, data providers, policy makers and practitioners and services the growing demand for open-source access and evidence-based decision-making.